The following recipe for Corn Flake Wreaths was submitted by HI Cookery, and is similar to the Rice Krispy Wreaths we have shared in the past. I especially love the suggestion of replacing the red candies with three purple and one pink for Advent. Thank you Highlander and Islander! We have at least two wreaths in our home during the holidays: an Advent wreath with purple and pink candles and a Christmas wreath hanging on our front door. Another wreath, made out of corn flakes, is a sweet centerpiece on our table when we entertain. It is inexpensive and quick to make as an alternative to cookies and fruitcakes. 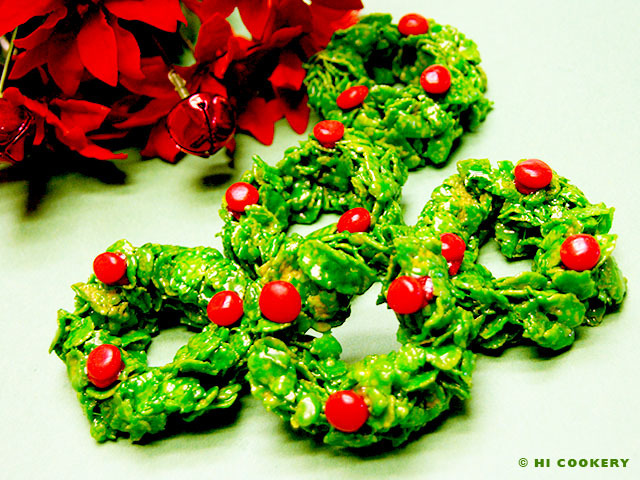 A corn flake wreath is a festive food and a delicious dessert at holiday parties and potlucks. Make one (or many minis) for a Merry Christmas! 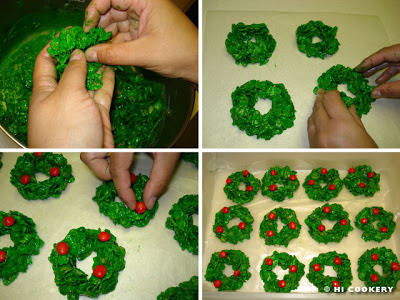 Have a sheet of wax paper and a pat of margarine or softened butter in a bowl ready on the work surface before assembling the corn flake wreaths. In a large pot, melt the butter over low heat. Add the marshmallows and stir until melted. 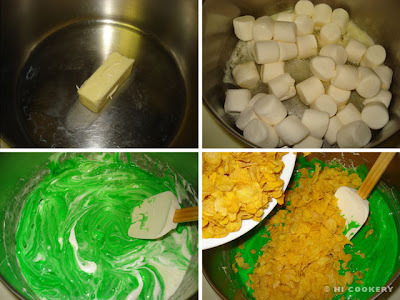 Remove from heat and stir in the green food coloring until thoroughly mixed. Add the corn flakes cereal and coat well. Using margarine or butter, grease fingers and quickly shape the cereal mixture into mini wreaths or one large wreath on a sheet of wax paper. 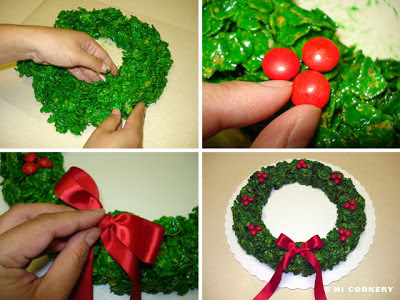 Let cool and transfer the wreath(s) to a platter or round cake board. With a little amount from a tube or red frosting, dot one side of a red candy and place randomly on the wreath. Attach a bow with a toothpick (optional). Store in an airtight container until ready to serve. For an Advent-style wreath, replace the red candies with three purple and one pink candle. Try this recipe with rice cereal instead of corn flakes. Eat…drink…and be merry! Highlander and Islander wish you all a very Merry Christmas! My kids would love that. Thanks for sharing!